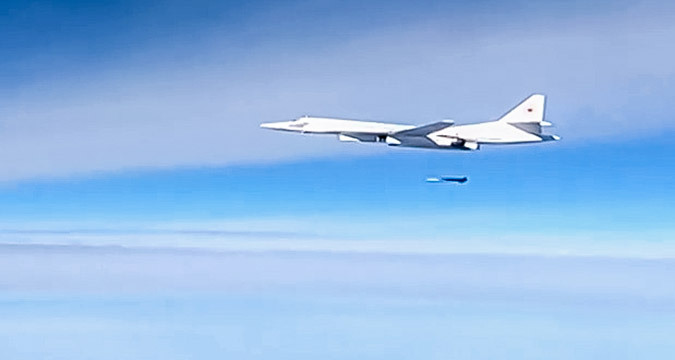 A Kh-555 air-launched cruise missile is launched by a Tupolev Tu-160 supersonic strategic bomber to strike the Islamic State infrastructure facilities in Syria. Russia has launched airstrikes against ISIS targets in Syria using strategic long-distance bombers for the first time. Russian experts see the use of long-range missiles as a testing ground for new types of weapons, as well as a good way of intensifying the airstrikes in Syria, since other accessible resources have now been exhausted. Russia has used its strategic long-distance bombers against ISIS for the first time, striking targets in the Syrian town of Raqqa, the radical jihadist organization’s de facto capital, on Nov. 17. In the course of the strikes, in a flight that lasted five hours and 20 minutes, the Tu-22M3 planes covered a distance of 2,800 miles (4,510 km), while the strategic Tu-160 and Tu-95MS missile carriers remained in the air for eight hours and 20 minutes and 9 hours and 30 minutes, respectively. According to the Defense Ministry's press office, the strategic missile carriers launched 34 cruise missiles during the mission, which saw the first combat use of the new X-101 strategic air-launched cruise missiles. The X-101 has a range of 3,400 miles (5,500 km). In the last two-three years the Tactical Missile Weaponry Corporation (which includes the Raduga scientific-productive association, the developer of the X-101) has put "about 10 new products" into operation, including long-range missiles, according to a statement made by the corporation's director Boris Obnosov in 2014. According to Obnosov, the corporation is keeping pace with the U.S. in terms of developing long-range precision tactical weapons and in some fields even has an advantage. In this sense the bombing of terrorist positions could have been a "trial run" of new types of weapons, as in the case of the launching of the Caliber cruise missiles from the Caspian Sea on Oct. 7. Observers interviewed by RBTH are of the opinion that the use of long-range aviation against ISIS can be considered an "act of revenge" for the terrorist act that downed the Russian passenger airplane over Egypt’s Sinai Peninsula on Oct. 31, resulting in the deaths of all 224 people aboard. "The use of long-range aviation is natural and the only way to quickly intensify the airstrikes in Syria,” said independent expert and author of August Tanks Anton Lavrov. “The base and the group in Latakia are now acting with limited capacity. From a military viewpoint, the objectives that would require two dozen strategic bombers simply do not exist in Syria," he said. Russia's only aircraft carrier, the Admiral Kuznetsov, could perhaps act as a reserve for Russia's air force in Syria. The ship, which carries 12 multipurpose MiG-29K fighter jets with precision missiles and 14 heavy Su-33 carrier-based jets with unguided missiles, could be of vital support to the air force at sea. However, currently the aircraft carrier is located in the Barents Sea and is conducting combat preparation exercises. However, editor-in-chief of the specialized website Voeniy Paritet (Military Parity) Andrian Nikolayev believes that strategic bombers are being used solely with the aim of creating a demonstrative effect. "In the conditions of international sanctions Moscow must show its muscles, that is, its capabilities in countering terrorism in order to increase the chances of lifting the sanctions," he told RBTH. In Nikolayev's view, this is precisely why Russia has decided to replicate the U.S.'s combat experience, sending its Tu-160 and Tu-95MS bombers with mandatory use of winged missiles for the massive airstrike. "However, this experience is outdated. Currently, for targeted strikes the West is effectively using the Predator and Reaper armed unmanned aerial vehicles. Russia still does not have attack drones. That is why it must use what it has, even if it's rather extreme," he said.